Thanks to the wonderful Jack Quartet ( http://www.jackquartet.com ) for playing this piece at CCRMA (Stanford) and for all the concerts they gave on their West Coast tour. This piece is for amplified string quartet (through Supercollider). The gain of the microphones is set extremely high and then limited extremely hard. The frequency of a filter (one for each instrument) is then moved up and down over the course of the piece. This processing produces various pops, rumbles, and occasional soft feedback. The result is then sent through 8 channels creating a strange low-fi texture, which hovers above/around the live sound. Please enjoy this stereo rendering. This took place as part of an evening curated by Laura Steenberge at CCRMA in May 2013. 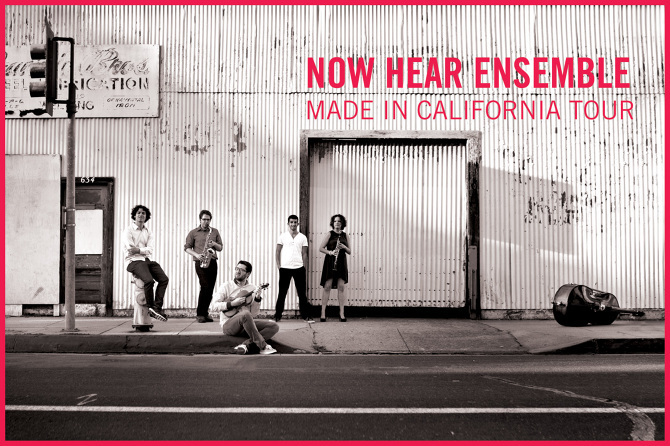 “And After” is my contribution to Now Hear Ensemble’s “Made In California Project. The album for the project has just been released – on iTunes, Amazon etc..